Le Mans Prototype 2 (LMP2) – LMP675 class was introduced in 2001 for cars which could weigh no less than 675-kilograms. 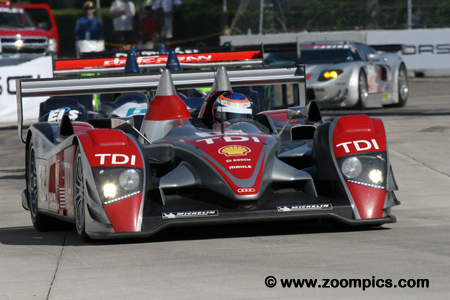 In 2004, this became the LMP2 class and the minimum weight was set at 775-kilograms (approximately 1,708-pounds). The rules were written so that the two LMP classes (LMP1 and LMP2) would be contending for the overall win. 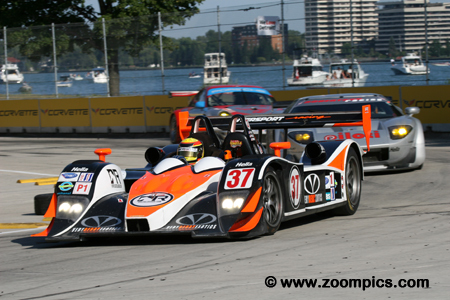 Manufacturers producing cars for this class included the Lola, Acura, Zytek and Porsche. 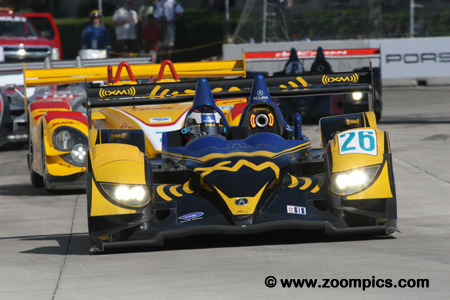 The LMP2 caategory used smaller engines producing between 500-550 horsepower. 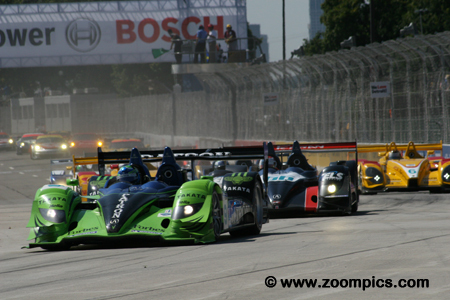 Round nine of the eleven race American Le Mans Series was conducted at Detroit’s Belle Isle. The Raceway at Belle Isle is a thirteen-turn 2.070-mile street course. The pole-sitter, Scott Sharp leads the field into turn one driving the Patron Highcroft Racing Acura ARX-01b that he would share with David Brabham. Behind Sharp is the other front row starter in another Acura, Simon Pagenaud. Pagenaud’s teammate at de Ferran Motorsports was team owner, Gil de Ferran. A total of twenty-eight entries started the two-hours, forty-five-minute event. 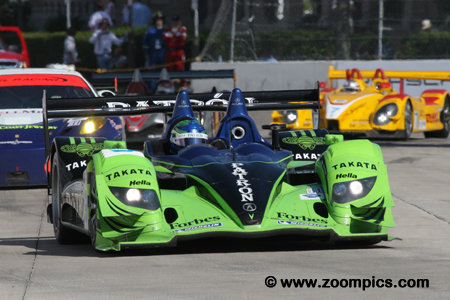 The Andretti Green Racing Acura ARX-01b started fourth overall and in the LMP2 category but it was the slowest of the Acura entries. However, that was of little consequence as the drivers, James Rossiter and Franck Montagny took the class victory and overall win when the No. 1 Audi was disqualified for being 2.5-kg. underweight. This was the team’s first victory since their debut in 2007 at the Twelve Hours of Sebring. It wasn’t a very good qualifying session for the No. 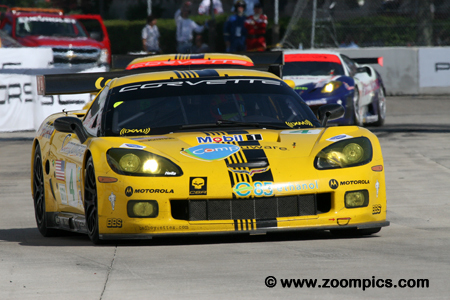 4 Corvette Racing Chevrolet Corvette C6R. Oliver Gavin and Olivier Beretta were second in GT1 but started behind three GT2 entries. However, the pair took the class lead on the first round of stops when they beat their teammates (O’Connell and Magnussen) out of the pits. They led the rest of the way and captured their first victory since March. After an exciting qualifying session it was Wolf Henzler driving the No. 45 Flying Lizards Motorsports Porsche GT3 RSR that would capture the GT2 pole-position. Henzler would share the driving duties with Jorg Bergmeister. It was business as usual for Henzler and Bergmeister, the GT2 championship point’s leaders won for their fourth time this season. Their margin of victory was a comfortable 6.570-seconds. It was a bizarre weekend for the LMP1 class. As predicted, the two Audis started first and second in class with the third LMP1 entry from Intersport Racing qualifying eleventh overall. On lap-21, the No. 2 Audi retired after crashing. It appeared that the No. 1 Audi would win but the car failed the post-race technical inspection. The victory went to the No. 37 Lola B06/10 of Richard Berry, Jon and Clint Field. 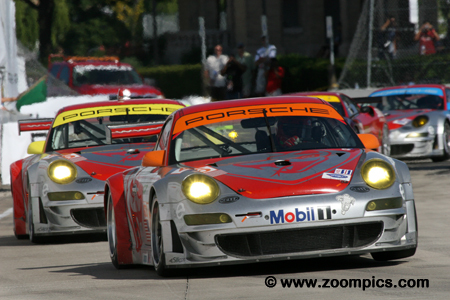 Flying Lizards entered three Porsche GT3 RSRs. The No. 46 entry was shared by Johannes van Overbeek and Patrick Pilet. 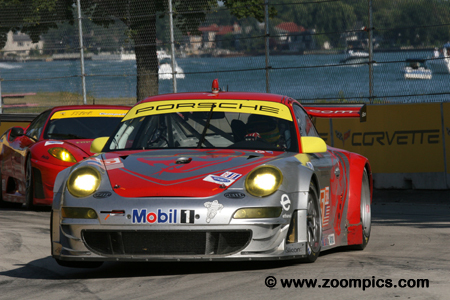 They started seventeenth overall and fourth in GT2. Van Overbeek moved the car into the class lead but was hit by the LMP2 Porsche of Timo Bernhard. Despite this setback, he and Pilet were able to continue. They finished second in GT2 giving Flying Lizards their third one-two finish of the season. Jamie Melo topped the timesheets for most of the qualifying session but in the end, he was outpaced by the Porsche of Wolf Henzler. 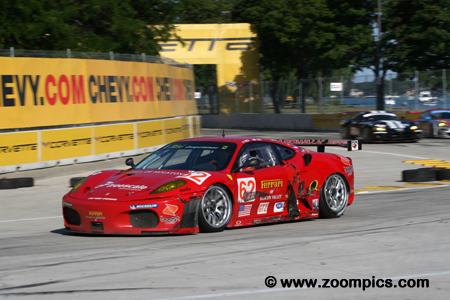 Melo and his teammate, Mika Salo would start second in GT2 racing the Risi Ferrari F430 GT. The Ferrari remained in contention until the mid-point of the contest. Salo stopped to have the door fixed but was exceeded the pit lane speed limit and was penalized. They finished third in class. Starting in the overall and LMP2 class pole was the No. 9 Acura ARX-01b. David Brabham was the fastest qualifier and would share the driving duties with Scott Sharp. The duo was able to stay in contention during the race but finished second in class – 3.985-seconds behind the winners, Montagny and Rossiter. More important, their performance moved them to within four points of the championship leaders, Bernhard and Dumas. 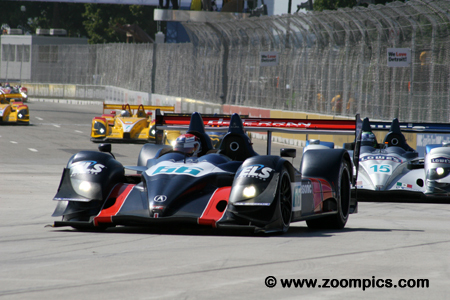 The first two rows of the grid at the Detroit Sports Car Challenge were all Acura. 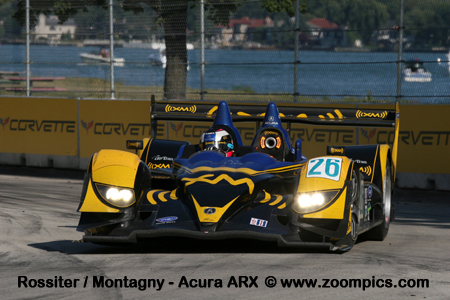 The second quickest of the ARX-01b’s was the No. 66 entry shared by team owner, Gil de Ferran and Simon Pagenaud. Pagenaud and de Ferran were unable to match the pace of the winning Andretti Green Racing entry but remained on the lead lap and finished third. Their performance resulted in a sweep of the overall podium for Acura. Marco Werner and Lucas Luhr qualified behind their Audi Sport North America teammates, Marcel Fassler and Emanuele Pirro. Luhr was at the wheel when he crashed the Audi on lap-21. With the retirement of the No. 2 car it was an easy victory for Fassler and Pirro. However, their vehicle failed the technical inspection. This turn of events allowed Werner and Luhr to clinch the LMP1 championship.